Used Infiniti Q30 Review - 2016-present | What Car? 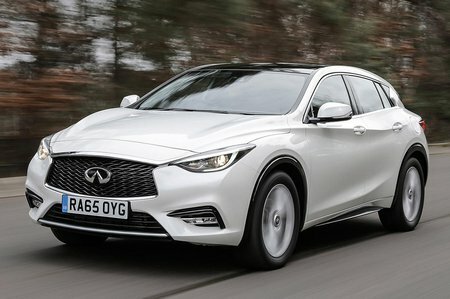 What's the used Infiniti Q30 hatchback like? It’s been on sale since 2016 but the chances are you won’t have seen many of these Q30s on the road. This car is actually Infiniti’s contender in the premium family hatchback market, and it offers a leftfield alternative to those who would habitually buy rivals like the Audi A3, the BMW 1 Series and the Mercedes-Benz A-Class without blinking. It was never going to be a huge seller, admittedly, and to make any headway in this market the Infiniti was always going to have to be a little bit special. However, despite the fact this brand was a new and, in the UK at least, an unknown name on the car scene, the Q30 had a bit of a head start – you see if you peer under its idiosyncratic bodywork you’ll find that it actually shares its underpinnings with the aforementioned A-Class. This is actually a direct result of Infiniti being the luxury car division of Nissan, who are part of a wide-ranging car alliance with Renault and the mighty Daimler organisation, home of the Mercedes-Benz. Its engine range is therefore inherited from Daimler: there’s a 108bhp 1.5-litre diesel engine, shared with not only the A-Class but also with certain Renaults, a 168bhp 2.2-litre diesel and a 1.6-litre and 211bhp 2.0-litre turbocharged petrol units. As for trims, there are seven levels to choose from - SE, Premium, Premium InTouch, Premium Tech, Premium Tech InTouch, Sport and Sport InTouch. The entry-level SE model comes with rear parking sensors, active emergency braking, hill start assist, 18in alloy wheels, automatic headlights and heated wing mirrors as standard on the outside, while inside there is a 7.0in touchscreen infotainment system, air conditioning, six speaker audio system and cloth seats. Premium models gain heated front seats, electric lumbar support for the driver, dual-zone climate control, electrically folding mirrors, cruise control and rain sensing wipers. Premium Tech trim adds privacy glass, LED headlights, wood trim and Nappa leather seats, while the range-topping Sport Q30s come with Alcantara interior and upholstery, and a sporty-looking body kit. 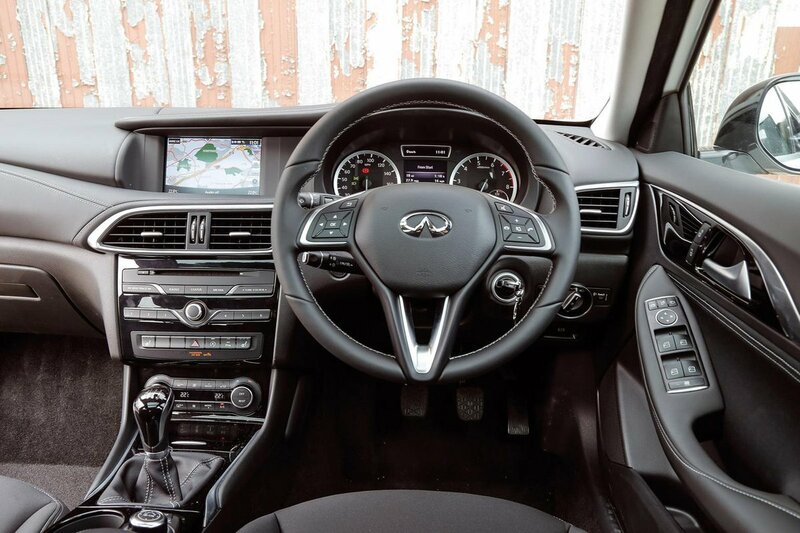 Those trims suffixed with InTouch also gain Infiniti's sat-nav and traffic sign recognition systems, and a DAB radio. On the road, the 1.5 diesel is excessively noisy, this noticeable at almost any speed but most especially when you drive it in anger – which considering the lack of oomph you’ll have to do. The larger 2.2 is quieter and stronger but along with that comes higher running costs and poorer fuel economy. The 1.6 and 2.0-litre turbocharged petrol engines make the Q30 more refined, but can’t hope to match the diesel units on economy. Of the two petrol engines, the 1.6 offers a more acceptable combination of performance and economy. Perhaps it shouldn’t come as a surprise that the driving performance is a little below average, as the car shares some of its underpinnings with the third-generation A-Class, which we also reviewed poorly for its on-road dynamics. The Q30’s ride is upset on anything more challenging than a mildly uneven road surface. So, for the average town driver, who experiences speed bumps and potholes as frequently as red traffic lights, this would not be the first choice for comfort. You may get a headache too, as wind and road noise is far from filtered out. The softly sprung chassis provides a lot of lean in sharp turns, yet the weighty front end reacts slowly to the steering, which in turn feels short of communication. There are some positives, though, and when it comes to the Q30 these can be found in the form of a generous adjustment for both the steering wheel and the driver’s seat. There’s electric lumbar support too, on all models above the entry-level SE. Mind you, the driving position is relatively high and there is a shortage of side support to keep you in place during faster cornering. The pedals are also offset to the right which creates an awkward driving angle. Although the gadgets and smart features are all there, they aren’t very well thought out. The climate control buttons are so low down that you can’t reach them easily whilst driving, the 7.0in infotainment screen’s graphics aren’t particularly sharp and the rotary controller that is used to scroll through the unimpressive menus is clumsy to use. The interior is a mix of classy leather-covered surfaces and cheap plastic which, combined with the gimmicky mod cons and the fact that you only get a standard DAB radio on the pricier models, makes the car feel very uninspiring inside. In terms of space, Infiniti has compromised back-seat comfort for boot size. There is little leg room even for average-height adults in the back seats and a rising rear window line, which makes the rear of the car feel a little claustrophobic. It would be a squeeze to fit three adults in the back, and the middle passenger would have a raised seating position and central tunnel to make matters worse. Perhaps if you are more likely to carry luggage than extra passengers, the 368-litre, easily accessible boot is more appealing. However, even with 60/40 splitting rear seats, the boot does not have a dual-height floor like many of the Q30’s rivals. At least you’ll be safe. All versions come with a five-star Euro NCAP rating, seven airbags and autonomous emergency city braking, which applies the brakes automatically if you are about to hit the car in front.